Death by starvation, drowning, and execution was the fate of 19 members of the US Army’s Lady Franklin Bay Expedition that was charged in 1881 to explore the northern reaches of the American continent. Only six members returned alive, however, they carried papers of tidal observations that they had made at Discovery Harbor at almost 82 N latitude, less than 1000 miles from the North Pole. Air temperatures were a constant -40 (Fahrenheit or Celsius) in January and February. While I knew and wrote of this most deadly of all Arctic expeditions, only 2 days ago did I discover a brief 1887 report in Science that a year-long record of hourly tidal observations exist. How to find these long forgotten data? Sea-ice foot at Distant Cape near Discovery Harbor in June, 1882. Photo by G.W. Rice, Library of Congress. My first step was to search for the author of the Science paper entitled “Tidal observations of the Greely Expedition.” Mr. Alex S. Christie was the Chief of the Tidal Division of the US Coast and Geodedic Survey. He received a copy of the data from Lt. Greely. His activity report dated June 30, 1887 confirms receipt and processing of the data, but he laments about “deficient computer power” and requests “two computers of standard ability preferable by young men of 16 to 20 years.” Times and language have changed: In 1887 a computers was a man hired to crunch numbers with pen and paper. 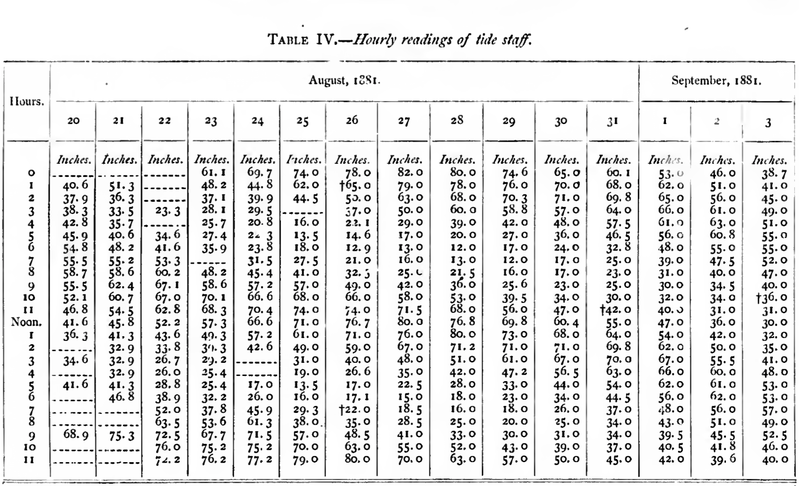 Data table of 15 days of hourly tidal sea level observations extracted from Greely (1888). 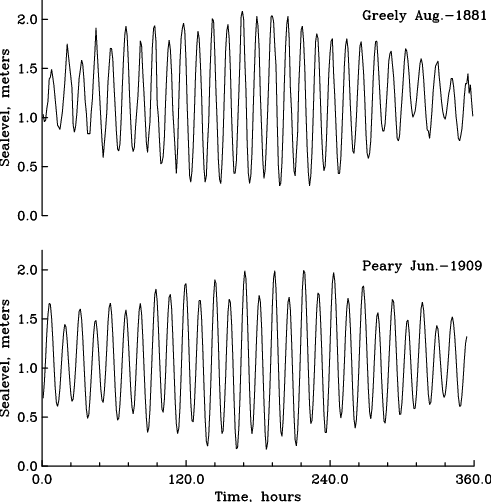 Hourly tidal observations at Discovery Harbor taken for 15 days by Greely in 1881 and Peary in 1909. Tidal sea level data from a pressure sensor placed in Discovery Harbor in 2003. Each row is 2 month of data starting at the top (August 2003) and ending at the bottom (July 2004). There is more to this story. 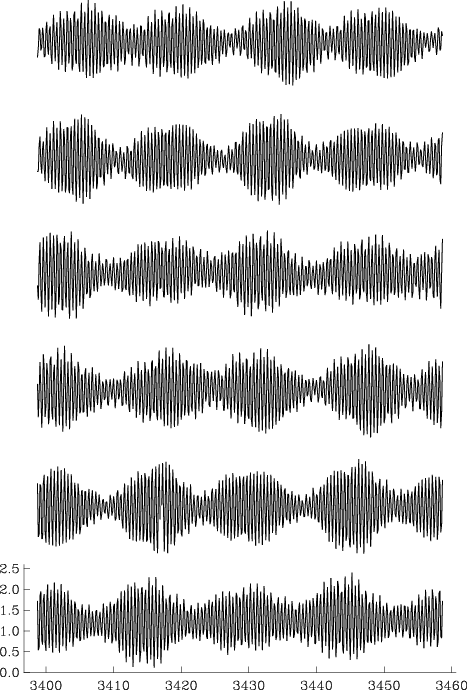 For example, what happened to the complete and original data recordings? Recall that Greely left Discovery Harbor late in the fall of 1883 after supply ships failed to reach his northerly location two years in a row. This fateful southward retreat from a well supplied base at Fort Conger and Discovery Harbor killed 19 men. Unlike ghostly Cape Sabine where most of the men perished, Discovery Harbor had both local coal reserves and musk ox in the nearby hills that could have provided heat, energy, and food for many years. It amazes me, that a 1-year copy of tidal data survived the death march of Greely’s party. It took another 18 years for the complete and original records to be recovered by Robert Peary who handed them to the Peary Arctic Club which in 1905 morphed into Explorer’s Club of New York City. I suspect (but do not know), that these archives contain another 2 years of data that nobody but Edward Israel in 1882/83 and the archivist in 2003 laid eyes on. 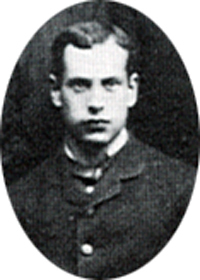 Sergeant Edward Israel was the astronomer who collected the original tidal data. He perished at Cape Sabine on May 29, 1884, 25 years of age. Edmund Israel, astronomer of the Lady Franklin Bay Expedition of 1881-1884. Christie, A.S., 1887: Tidal Observations of the Greely Expedition, Science, 9 (214), 246-249. Greely, A.W., 1888: Report on the Proceedings of the United States Expedition to Lady Franklin Bay, Grinnell Land, Government Printing Office, Washington, DC. Guttridge, L., 2000: The ghosts of Cape Sabine, Penguin-Putnam, New York, NY, 354pp. This entry was posted in Computing, History, Oceanography, Polar Exploration and tagged Arctic Ocean, data, Discovery Harbor, Ellesmere Island, Fort Conger, Greely, moorings, Peary, tides. Bookmark the permalink. Siegfried R. (on FaceBook): Schön. Und aus der Welt, ganz ohne Politik. Oder? @Siegfried: No, it takes a community of people (polis) to put expeditions out and it takes another community (the people on it) to make it succeed or fail. Resources are always limited (money, people, time) and rules exist to distribute them. Strict adherence to rules can be both a strength and weakness: One member of the expedition was executed for stealing food; 19 people starved to death because the commander was following orders to abandon a well-supplied and sheltered location. All these are political aspects of human interactions. The failure of the US Army to get its people out of the Arctic provided a basis for the US Navy to shine and get a larger amount of funds for future ship-building. Politics, again. “Ghosts of Cape Sabine” was one of the most fascinating books I ever read, and at the same time, most troubling….congratulations to you on your quest for finding the data you were looking for. The story is one that most people don’t know about: it isn’t taught in U.S. History in schools, and geography isn’t taught anywhere these days in the U.S. However it paints a very poor picture on the politicians and bureaucracies during that time period. I chanced upon your article, and glad I found it!